Kwamikrom, June 21, GNA - Mr Kwasi Owusu-Yeboa, Volta Regional Minister, was on Monday elected the New Patriotic Party (NPP) candidate for the Biakoye Constituency. He polled 64 votes to beat Mr Collins Boateng, Chief Executive Officer (CEO) of the Export Promotion Council (EPC), who polled 50 votes in the elections conducted by officials of the Regional Electoral Commission, led by Mr Muhammed Adoquaye, Regional Director. The Minister thanked the delegates for the confidence reposed in him and pledged to work hard to win the seat. He told the delegates that he would be transparent in his electioneering campaign, adding, the immense goodwill enjoyed by the NPP should be harnessed to capture the seat from the National Democratic Congress (NDC) in Election 2004. Mr Owusu-Yeboa advised the people to do away with the acrimony that characterised the primaries, saying that it should rather re-energise the goodwill of the Party in the constituency. Mr Boateng pledged his support and resources to assist Mr Owusu-Yeboa to enable the Party to win the seat. He said the misunderstanding, arguments and name calling before the primaries should belong to the past, "the challenge now is to deliver the Baikoye seat to the Party". 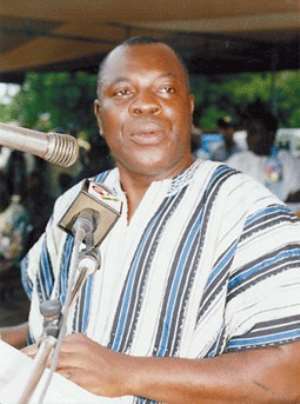 Mr Lord Commey, National Organiser of the NPP, thanked the delegates for their comportment and described the elections as "the mother of all primaries", equating it to the national congress. He said the increasing enthusiasm being accorded the Party in the Volta Region should be harnessed by Party supporters and sympathisers and urged them to gird their loins to work for victory. Among those present were, Madam Hawa Yakubu, Member of Parliament (MP) for Bawku-Central and Member of the ECOWAS Parliament, Mr Tommy Amematekpor, a Presidential Aide, Miss Gloria Akuffo, Deputy Attorney General, Mr Kofi Dzamesi Deputy Volta Regional Minister, some DCEs and Regional Executives of NPP.